Indonesia's 2007 strategy for saving the endangered Sumatran and Bornean orangutans has not gone according to plan, with both species continuing their decline. The authors of the 2007 action plan thought Indonesia's worst environmental problems, such as the rapid loss of forest where orangutans live, would be solved by now, according to a government official who helped to write the plan. Last year, the government set a new target to increase the population of 25 "priority species," including the Bornean orangutan, by 10% over 2013 levels by 2019. In 2007, Indonesia launched its Strategy and Action Plan for National Conservation of Orangutans, with the goal of stabilizing all wild populations — and their dwindling rainforest habitats — by 2017. In July, the IUCN declared the Bornean orangutan (Pongo pygmaeus) as “critically endangered,” the highest risk category. That put it on par with its cousin, the Sumatran orangutan (Pongo abelii), which has been listed as critically endangered — one step away from extinction — since 2008. Now, the government intends to revise the action plan, whose ambitious targets were either missed or vague to begin with. Both species’ numbers have continued to decline, with only 54,000 Bornean orangutans and 14,600 Sumatran orangutans thought to remain. An estimated 1,500 still live in rescue centers located across Sumatra and Borneo, even though the 2007 plan called for the rehabilitation and reintroduction into the wild of all captive orangutans by 2015. 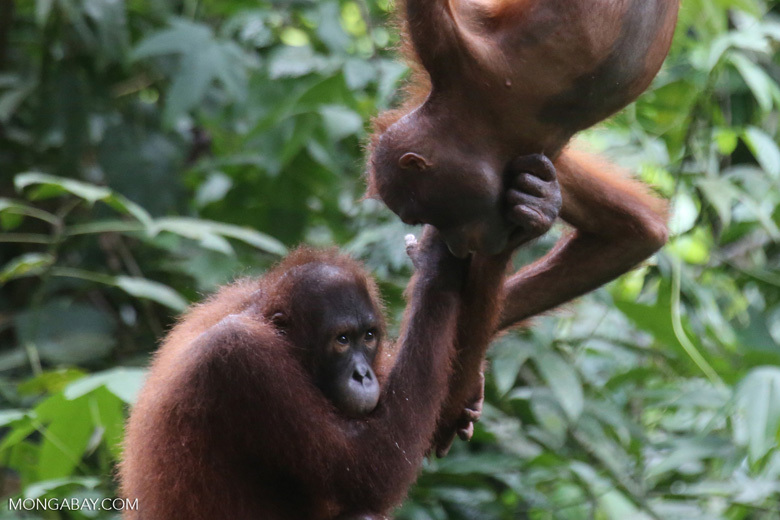 Other goals included enhancing public support for orangutan conservation and implementing a management system to ensure their survival — too imprecise, according to Erik Meijaard, a Jakarta-based conservation scientist who coordinates the Borneo Futures Initiative. Although the government has declared saving orangutans a priority, it has also set ambitious targets for increasing the production of palm oil, one of Indonesia’s biggest exports. The breakneck expansion of oil palm plantations is one of the biggest drivers of deforestation in a country that lost 6 million hectares of primary forest — an area larger than Croatia — from 2000 to 2012. Tachrir Fathoni, the Environment and Forestry Ministry’s director of ecosystem conservation, agreed that the government “must work harder” in order to save the orangutan. “The key is we need to preserve its habitat. If the habitat is good, and there’s enough food, and there’s no more hunting and enough protection, they can grow on their own,” Fathoni told Mongabay. The Bornean orangutan’s new “critically endangered” status was not surprising, said Chaerul Saleh, a wildlife conservation specialist with WWF-Indonesia who worked on the 2007 action plan. Saleh said that when the plan was drafted, the authors assumed that many of Indonesia’s environmental problems would have been brought under control by now. “Not to point fingers at anyone, but at the time, we didn’t imagine that forest conversion, habitat loss and hunting could still be happening,” he said. After last year’s devastating agricultural fires, caused by slash-and-burn land clearing practices and an extended dry season brought on by El Nino, President Joko “Jokowi” Widodo declared a ban on new oil palm permits and on developing peat bogs, whose widespread draining and drying for agriculture creating the conditions for the fires to spread. Many orangutans are trafficked for sale as pets. More than 70 were traded in this way between November 2015 and April, according to the WWF. “That’s something we never imagined — that [owning] an orangutan would somehow become a trend, a lifestyle, even a status symbol. To me that’s a horrible fact,” Saleh said. Last year, the Environment and Forestry Ministry named 25 “priority species,” including the Bornean orangutan, and set a target to increase each of their populations by 10% over 2013 levels by 2019. That’s 2% per year. That’s an ambitious target, said Meijaard, the conservation scientist, considering the Bornean orangutan is currently declining at a rate of 2.5% per year. “Orangutans are very slow breeders, so an increase of 2% [per year] is pretty much impossible,” he said. Saleh added that the government needs private sector support, since more than half of all orangutan habitat overlaps with forest area designated for something other than conservation.